One of the biggest issues that deter gardeners from growing roses is the notion that rose bushes are high maintenance plants. Ok the truth is in the grand scheme of things, they sort of are, but the actual work of maintaining them is not as difficult as everyone would have you believe. Rose bush care is more about developing a routine and just a little bit of discipline, more than anything else. Now there is a lot of "expert" information out there to tell you how to care for rose bushes, but in my own research I found much of it to be cluttered and difficult to read. What good is a guide on rose bush care maintenance if you can't even understand it? So what we've done here is compiled a list of important tips and techniques to growing roses, that just about anyone should be able to follow. If you have read other articles throughout our website, you will see that we suggest mulching on just about any type of plant that you might grow. While there are a few plants that might perform better without it, mulching is a universal tip that benefits most types of plants. The reason is actually quite simple. Mulch creates a barrier between the plant leaves and the soil, where many bacteria and pests live. Mulch also helps to regulate the soil temperature as well as trapping moisture before it drains away. Both of which are important to the growth of any plant. Fertilizing roses is extremely important if you are looking to get the best results from your plants. It is best to fertilize roses on a routine schedule. When you first plant your roses, you hopefully sprinkled a little bit of nitrogen rich fertilizer in the hole before filling it up. Beyond that it is a generally accepted practice to give roses another does after each flush, or blooming cycle, as this will help them ramp up for the next flush of blooms. Fertilizing is essential for proper rose bush care maintenance. Rose bushes are very thirsty plants and will usually drink up a lot of water. There is a fine line however between giving them ample water for growth, and giving them too much that could end up leading to diseases and rotting. 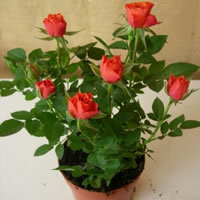 When you first plant roses, they need a lot of water the first year or two until they have established strong roots. During this period it is critical that you pay close attention to the wetness of the soil. Water them deeply and then give them ample time to drain before the next watering. A good rule of thumb is check them weekly. Deadheading roses is a task many of us dread doing because it can get a little tedious at times, however it is one of the most important tasks you should perform and I'll explain why. All roses will eventually bloom as part of their life cycle, and as the flowers begin to fade and the petals drop off, the plant will switch gears and start to create seeds. At this point the plant stops spending energy on new shoots. Once a bloom starts to fade, the proper rose bush care maintenance is to cut it off at an angle, just above a node. This will "trick" the plant into producing another shoot out of the node and producing another bloom. It should go without saying, but just in case, you do not need to bother dead heading varieties that only bloom once a season. 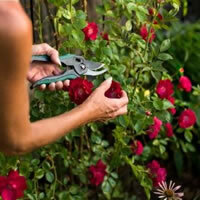 There are two types of pruning when growing roses, pruning at the beginning of the growing season, and pruning suckers during the growing season. Both are equally important to the development of the rose bush. While there are some exceptions with certain varieties, most major pruning is done in the early spring time just before the plants start their growing season. You want to remove all dead of diseased canes, as well as any canes that do not originate out of the bud union. You should also clear out any canes that cross one another. When done yearly, you should rarely have to remove more than 2-3 canes each year. The goal of pruning is to create an open center plant with 3 or so main canes growing out of the bud union. Not only does this create excellent airflow through the rose bush and help prevent diseases, but as the plant starts to develop leaves, it allows sunlight to penetrate the center of the bush and more leaves will be able to generate food for the plant. This is essential if you are hoping for a lot of blooms. Removing suckers is pruning that is done during the growing season. 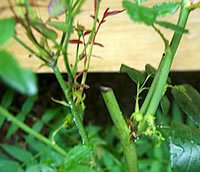 Suckers are the long, thin stems that sprout out of the base of the rose bush, below the bud union. They call them suckers because all the do is rob nutrients from the rest of the plant. Do not cut these off as it will only encourage more to grow. Grab the base of the sucker and pull it downward until it snaps off, even if you have to dig away a bit of the soil to get to it. If you simply cut the suckers, you will leave behind the growth eyes from which it formed, paving the way for more to follow in its place. These are just a few of the most important tasks you can perform in rose bush care maintenance. None of these tasks are difficult and if you develop a regimen, you can accomplish them all rather easily and not only will your rose bushes be happy, but they will reward you with bright and stunning blooms!